Whether you're a sports fan or not, it's incredibly difficult not to join in the fun; especially when many of the festivities are free!! 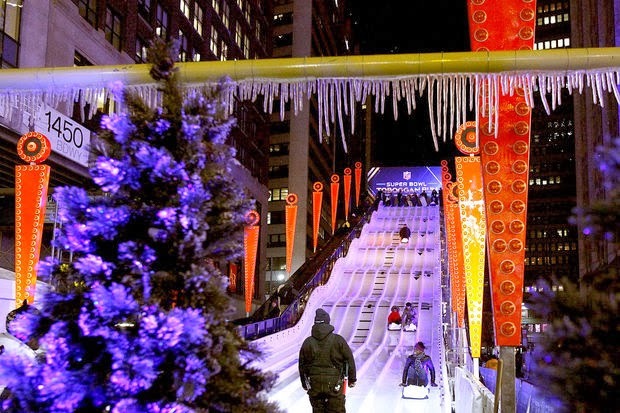 I couldn't wait to visit the Toboggan Run at Super Bowl Blvd at Manhattan's 6th Avenue - ILLLLL! I was even more anxious to see J Cole and TLC perform for VH1's Super Bowl Blitz concert series. The Blitz x 1iota Concert Staff put together a concert series, which held a different concert (and different artist) in each of the 5 boroughs and New Jersey for six days straight. The concerts were jammed packed at exclusive venues. I attended J Cole's concert at Queens College and TLC's concert at The Beacon Theatre and had a ball at both. See pics and video of both concerts below. If you can't tell from the photos or haven't seen J Cole perform live, there is three things you must know.... He's enjoys performing. He loves QUEENS and He LOVES HIS FANS!!! Great Show.... Oh yeah and Happy Birthday! He also performed the next day (his birthday, January 28th) at Madison Square Garden. Another awesome show.